Occasionally, I'll come across an author who whines something like, "Poor Joseph, there's really not much written about him! Oh, well!" To that I reply: You're full of it! Whew. Thanks, I needed to get that off my chest! Back to the list ... While I've cited a few of the titles in my Joseph posts, I figured hey, why not list 'em all in one spot for ease o' reference? 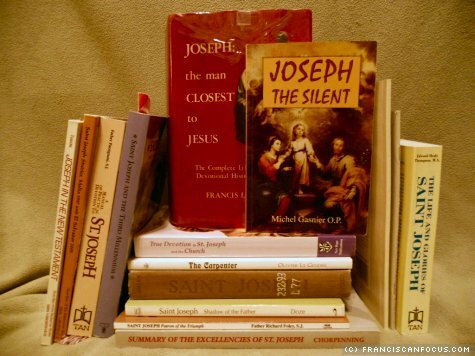 So, following is a handy-dandy list of Josephite books for all your Josephy needs (and I own all of 'em save the Bibliographie, which, at 55 bucks a pop, I'm working my way up to ordering). Considered to be the definitive Josephological tome out there, this is essential reading. Seriously. Anyone who considers themselves devoted to Joseph must read this (honkin' big) sucker; not reading it is akin to a chemist waving off study of the Periodic Table of Elements. While it's out of print, you can find a copy through used booksellers (I got mine through AbeBooks.com) or borrow one from your local library. Get crackin'! If you only read one Josephite book, make it this 'un. (Though you really should also read the previous one, but hey, this'll do if you're draggin' yer heels.) Gasnier presents a vivid and moving portrait of Our Glorious Patriarch, and it's all based on extensive research and serious study. This dude knows his stuff (no whiny crap here), and he presents it all in a relatively short, yet engrossing, read. The amount of info. that Fr. Toschi is able to draw from the NT about Joseph is just mind-bogglingly amazing. Sure, Scripture doesn't say a lot, but what it does say offers tons of food for thought, and Fr. Toschi delivers. I luv Fr. Toschi. Now that we've gotten those Top Three outta the way, here are the rest (alphabetical by title). This isn't a comprehensive list, just my faves. THE be-all, end-all Josephological bibliography, weighing in at 1,365 pages, with 19,725 entries! As the book's description says, it's "the single most important source of information about publications of all kinds (ecclesiastical, theological, devotional, artistic, etc.) on St. Joseph and the Holy Family." I got a look at this baby thanks to the wonders of interlibrary loan requests, and hoo-boy! You could cause some serious damage with it; it's especially useful for whacking "I-couldn't-find-anything-on-Joseph!" authors upside the head.